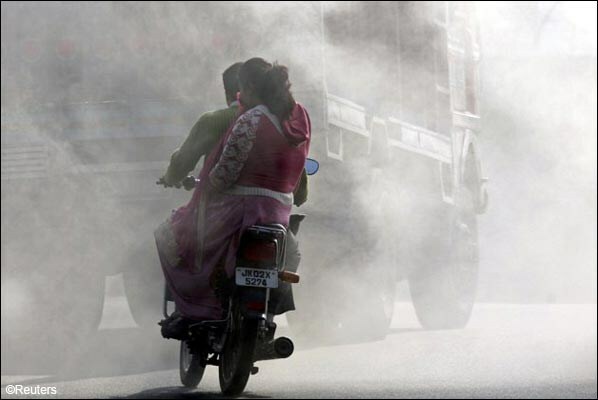 India’s air is the world’s unhealthiest. Davos: India’s has the worst air pollution in the entire world, beating China, Pakistan, Nepal and Bangladesh, according to a study released during this year’s World Economic Forum in Davos. Of 132 countries whose environments were surveyed, India ranks dead last in the ‘Air (effects on human health)’ ranking. The annual study, the Environmental Performance Index, is conducted and written by environmental research centres at Yale and Columbia universities with assistance from dozens of outside scientists. The study uses satellite data to measure air pollution concentrations. India’s high levels of fine particulate matter (a subject we’ve been looking at on India Ink, albeit just in Delhi) are one of the major factors contributing to the country’s abysmal air quality. Levels of so-called PM 2.5, for the 2.5 micron size of the particulates, are nearly five times the threshold where they become unsafe for human beings. Particulate matter is one of the leading causes of acute lower respiratory infections and cancer. The World Health Organization found that Acute Respiratory Infections were one of the most common causes of deaths in children under 5 in India, and contributed to 13% of in-patient deaths in paediatric wards in India. When it comes to overall environment, India ranked among the world’s “Worst Performers,” at No 125 out of the 132 nations, beating only Kuwait, Yemen, South Africa, Kazakhstan, Uzbekistan, Turkmenistan and Iraq. Neighbouring Pakistan, in contrast, ranked 120th and Bangladesh was listed as No. 115 on overall environment. It is not just India’s big cities which are grappling with air pollution, said Anumita Roychowdhury, Executive Director of India’s Centre for Science and Environment, a non-profit organization which was not involved in the study. Air pollution also is worsening in smaller cities, she said. The main culprit, Ms Roychowdhury said, is the growing number of vehicles in India. While the country still has far fewer vehicles per capita than developed nations, India’s cars are more polluting, Ms Roychowdhury said. Other air pollution experts also cite India’s reliance coal and polluting industries like brick-making that are located close to densely-populated areas. Emission standards are nearly “10 years behind European standards,” Ms Roychowdhury said, and these standards are not legally enforceable, unlike in countries like the United States which has the Clean Air Act. India has an Air (Prevention and Control of Pollution) Act, 1981 which is supposed to be enforced by the Central Pollution Control Board. This act lacks teeth, Ms Roychowdhury said. “We need to take big steps or the problem will overwhelm us,” she said. D Saha, a scientist in the “Air Lab” at India’s Central Pollution Control Board said the study’s findings were not a matter of huge concern. “We should not compare our country with others,” Dr Saha said. “India has a different terrain.” He cited seasonal rainfall, deserts and dusty conditions as being responsible for the particulate matter. “Can we put water sprinklers across the country?,” he asked. Particulate matter comes from boilers, thermal power plants and cars, as well, he said, but India would not have development if these activities were curbed, he said. “The diseases mentioned in the report are caused by many factors not just particulate matter, we are raising undue alarm,” Mr Saha said. India is densely populated and has high solar insolation, an ideal combination for using solar power in India. India is already a leader in wind power generation. In the solar energy sector, some large projects have been proposed, and a 35,000 km2 area of the Thar Desert has been set aside for solar power projects, sufficient to generate 700 GW to 2,100 GW. Also India’s Ministry of New and Renewable Energy has released the JNNSM Phase 2 Draft Policy, by which the Government aims to install 10GW of Solar Power and of this 10 GW target, 4 GW would fall under the central scheme and the remaining 6 GW under various State specific schemes. In July 2009, India unveiled a US$19 billion plan to produce 20 GW of solar power by 2020. Under the plan, the use of solar-powered equipment and applications would be made compulsory in all government buildings, as well as hospitals and hotels. On 18 November 2009, it was reported that India was ready to launch its National Solar Mission under the National Action Plan on Climate Change, with plans to generate 1,000 MW of power by 2013. From August 2011 to July 2012, India went from 2.5 MW of grid connected photovoltaics to over 1,000 MW. According to a 2011 report by BRIDGE TO INDIA and GTM Research, India is facing a perfect storm of factors that will drive solar photovoltaic (PV) adoption at a “furious pace over the next five years and beyond”. The falling prices of PV panels, mostly from China but also from the U.S., has coincided with the growing cost of grid power in India. Government support and ample solar resources have also helped to increase solar adoption, but perhaps the biggest factor has been need. India, “as a growing economy with a surging middle class, is now facing a severe electricity deficit that often runs between 10 and 13 percent of daily need”. With about 300 clear, sunny days in a year, India’s theoretical solar power reception, on only its land area, is about 5000 Petawatt-hours per year (PWh/yr) (i.e. 5000 trillion kWh/yr or about 600 TW). 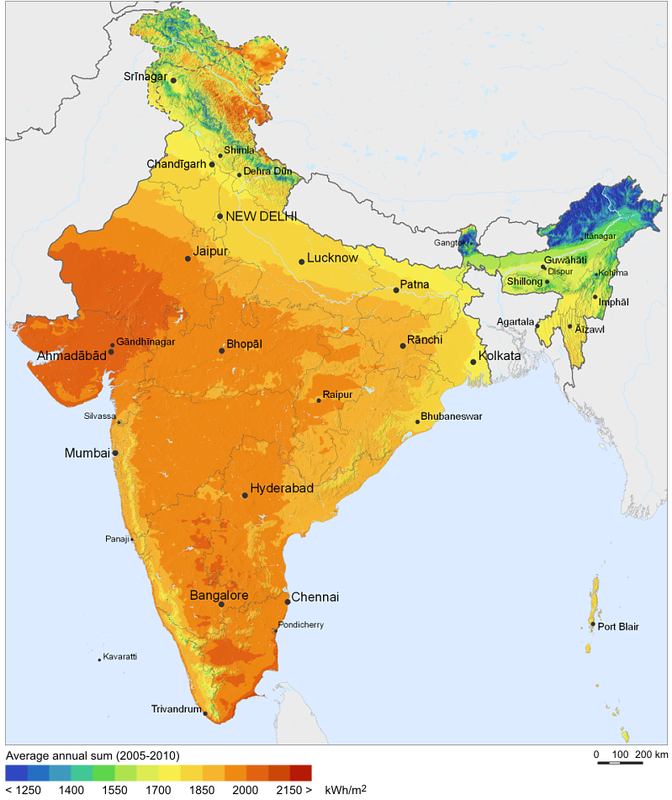 The daily average solar energy incident over India varies from 4 to 7 kWh/m2 with about 1500–2000 sunshine hours per year (depending upon location), which is far more than current total energy consumption. For example, assuming the efficiency of PV modules were as low as 10%, this would still be a thousand times greater than the domestic electricity demand projected for 2015. The amount of solar energy produced in India in 2007 was less than 1% of the total energy demand. The grid-interactive solar power as of December 2010 was merely 10 MW. Government-funded solar energy in India only accounted for approximately 6.4 MW-yr of power as of 2005. However, India is ranked number one in terms of solar energy production per watt installed, with an insolation of 1,700 to 1,900 kilowatt hours per kilowatt peak (kWh/KWp). 25.1 MW was added in 2010 and 468.3 MW in 2011. By the end of March 2013 the installed grid connected photovoltaics had increased to 1686.44 MW,and India expects to install an additional 10,000 MW by 2017, and a total of 20,000 MW by 2022. Ever heard the words, you have got to fight for what you want; if you don’t stand up for your rights, then who will? In short, you have to take matters into your own hands instead of being passive and just wishing the problem away. And take matters into their own hands is exactly what a group of villagers did. They literally clung (chipko, loosely translated meaning hugged) on to their rights. In 1974, in a small village named Reni located in the Himalayas, a group of female villagers stood their ground, embraced their beloved trees and saved their forest. They refused to let the contractor system of the State Forest Department decide their fate and rob them of their right to a better life. The trees do more than give aesthetic appeal to the village, they provide protection from landslides, they provide cleaner air, and they stop the erosion of land. The land that is important to the villagers for their and their live-stocks survival. Their protest paid off and their act of bravery inspired many similar acts on a grassroots level for forest protection. In the 1987, the Chipko Movement was awarded The Right Livelihood Award. This is a documentation of the shocking massacre of tens of thousands of migratory Amur falcons (Falco amurensis) in the remote state of Nagaland in India’s northeast. We estimate that during the peak migration 12,000 – 14,000 birds are being hunted for consumption and commercial sale everyday. We further estimate that a mind-boggling 120,000 to 140,000 birds are being slaughtered in Nagaland every year during their passage through the state. This is probably the single largest congregation of Amur falcons recorded anywhere in the world and it is tragic that they meet such a fate. Our team has alerted all appropriate authorities in Nagaland. Government officials we spoke to have committed to put an end to the slaughter and have initiated specific action steps outlined below. Conservation India will continue to monitor and report on the situation. It is significant to note that India, as a signatory to the Convention on Migratory Species (CMS), is duty bound to prevent this massacre, provide safe passage, as well as draw up appropriate action plans for the long-term conservation of this bird. In the recently concluded Convention on Biological Diversity (CBD), of which India is the president for the next two years, the importance of CMS in conserving species, and especially in stopping bushmeat hunting, was repeatedly stressed. 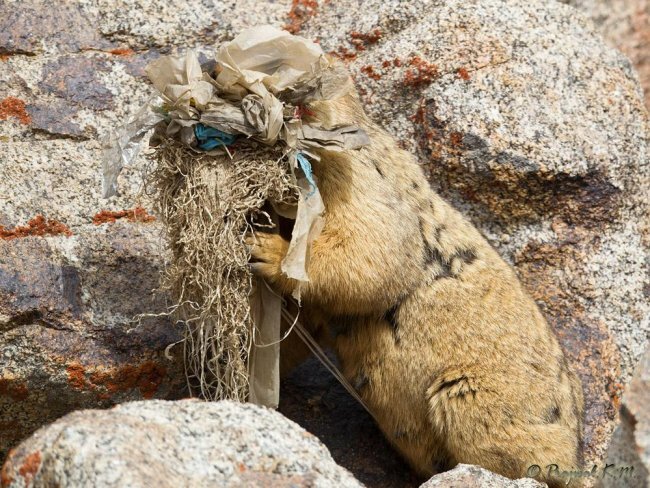 A female Himalayan Marmot (Marmota himalayana) gathering plastic as part of its nesting material. This photograph was taken enroute to Diskit from Leh. Plastic and other litter irresponsibly disposed by careless tourists on these remote roads can create serious problems for wildlife. Himalayan Marmots live in alpine meadows, grassland and desert conditions with very low rainfall, typically inhabiting slopes where soil can be readily excavated (Molur et al. 2005; Smith and Xie 2008). It lives colonies and excavate unusually deep burrows, which are shared by colony members during hibernation. Litter size is reported to be two to eleven young, after a gestation period of one month. In addition to the conventional threats to this species like hunting, mortality from domestic predators, habitat disturbance, and overgrazing of its habitat by domestic livestock (Molur et al. 2005), tourism to these remote parts poses a brand new threat. Peepal Baba was born in 1966 in Chandigarh, India. Born to a medical doctor in the Indian Army, he had the opportunity to travel across the country at a young age. He fell in love with the mountains, rivers and forests at a very young age. By the age of ten he started planting trees in his neighborhood. The hobby grew into a passion soon enough. Peepal Baba has been planting trees since January 1977. Based in Delhi, India, he travels all over the country to make efforts at spreading awareness for planting trees. He delivers talks and lectures to villagers, community gatherings, and students, institutions to create awareness towards importance of planting more and more trees. Peepal baba has himself planted several thousand of trees. He has been a role model for many. His enthusiasm and determination has inspired many to protect and plant trees. 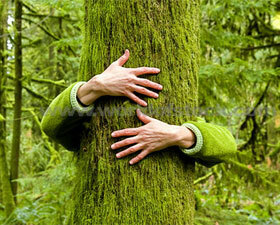 His life is dedicated to the increase of green cover on our planet. Today, at the age of 45, he goes about planting trees wherever he is invited. He is invited by families, institutions, communities, villages to inform them and inspire them to increase their green cover. As Delhi develops into the world class city that ‘many’ are working hard to make it, concretization is the key word. And the concerete does not seem to be seeing an electric pole apart from a tree. And even as much is being said to protect and increase the green cover in the city, the existing greens seem to be choking to death. Most trees are being surrounded by concrete to such an extent that it leaves no breathing space for the tree thus reducing their capacity to keep themself upright. 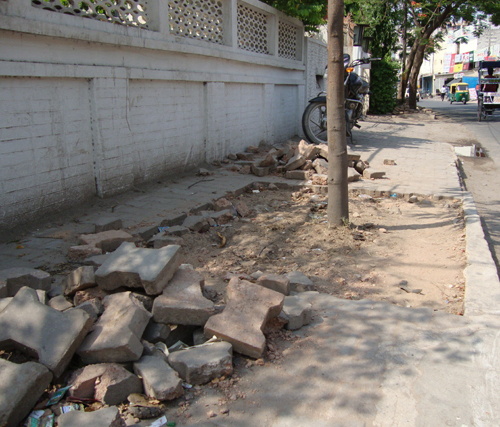 The de-concretization did see some opposition from some residents, especially those who had gotten it done themselves, but the enthusiasm for conserving nature and perserving natural heritage and the court order ensured that the work has been continuing and over 60 trees have been freed till date. What is now needed is a citywide initiative to take this campaign to every colony and complex in Delhi. The above was enough for Padmavati Dwivedi and her friends in her GK-I colony to persuade the Government, MCD and related authorities to follow the rules, uphold the law and remove the concrete cement from around all trees in their part of the colony. By Law: Such concretisation is in violation of the Delhi Preservation of Trees Act, 1994 and the Environment Protection Act, 1986. Why say no to – GMO ( Genetically Modified Organism ) ? Genetically engineered seeds (also referred to as GMO – Genetically Modified Organisms) mix genes in crops from unrelated organisms- for example genes from soil bacteria, fish etc, which could not have mixed through biological reproduction, and conventional breeding. Two techniques viz ‘gene gun’ and ‘plant cancer’ are used to implant a foreign gene from an unrelated organism to the plant. In addition, antibiotic resistance marker genes or viral promoter genes are also added in this process. The “yield” of a GMO crop is the yield of the original plant into which the new genes were introduced. Why say “NO” to GMO ? Majority of the GM seeds are produced by private enterprises and thus are patented. A patent prevent producer from saving and exchanging seeds, therefore undermining the farmers’ right on seeds. The producer has to buy fresh seeds for every cultivation season. In effect, producer loses seed sovereignty and become dependent on Multinational Corporations. GM seeds also increase the cost of production. As patented seeds carry a considerable amount as royalty fees which increases the market price. Moreover, GM seeds requires chemical pesticides and fertilizers as suggested by the inventors to produce the desired yield- an factor which could further increases the cost of production. GM crops can produce adverse health impact on both humans and livestock. The foreign gene in the GMO might behave differently in contexts other than the one they were taken from. This can give rise to severe allergic reactions. There were reports on adverse impact of Bt cotton on human health (skin and eye allergies) from Madhya Pradesh and on livestock (cattle deaths) from Andhra Pradesh in India. GM crops can contaminate non GM varieties through cross pollination. Thereby spreading their unknown side effects to nearby crop. Moreover, the health implications related to the long term consumption of GM foods remains largely unknown. India stands out for its glaring lack of infrastructure and food storage facilities, in a new study that says 21 million tonnes of wheat — equivalent to the entire production of Australia — goes waste in the country. Recent advances in agricultural technology have helped increase India’s grain production through developments including high-yield seeds for the past five years, Reuters reports. With all this excess food, it would appear that a solution to the Indian hunger problem has been found. But there’s a big problem — India’s storage facilities have not kept up with the grain’s pace of development. As a result, grain surpluses are now being stored outside, where the chances of rotting drastically increase. This inefficient system has deadly consequences. Instead of the grain filling the bellies of hungry Indians, it is feeding rodents and insects, growing fungus, and decomposing. Just this year, officials estimate that 6 million tons of India’s grain worth $1.5 billion could become inedible, according to Reuters. This is while 43 percent of children under 5 are underweight, according to UNICEF. Reuters reports that 3,000 children die every day from illnesses related to malnutrition. Bureaucratic inefficiencies and corruption are what hinder distribution to the hungry. Stories of corruption include distributors basically “cutting” the grain, mixing rotting grain with fresh grain and selling it on the market. Then there is what India’s press is calling the “mother of all scams,” with hundreds of government officials redirecting billions of dollars worth of grain away from the poor and into local and global markets. Even in 2010, when the Supreme Court directed the government to give the grain to the hungry for free rather than let it rot, state governments ignored the request or only distributed grain with low, subsidized prices to people with ration cards. While the grain is clearly not feeding hungry Indians, it is also not making the government any money either. Due in part to “good” monsoons, the surplus’ real impetus is provided by government subsidies to farmers, creating incentive to harvest as many crops as possible, even when the supply outweighs the demand. With the inflated prices the government pays to farmers for the crops, exporting the surplus becomes a problem because of the much lower market value the crops garner in world markets. According to the same Reuters article, the Indian government pays about $346 per ton. To be competitive in the market, a ton would have to sell for about $260. That $80 difference constitutes a huge loss for a government already running a high fiscal deficit. The crops don’t feed who they should and in the end, actually cost the government billions.